​Bayern Munich return to Bundesliga action after the winter break when they travel to Hoffenheim on Friday night. Niko Kovac, in his debut season at the helm, has seen his decorated outfit slip six points behind rival leaders Borussia Dortmund, as they look to rescue a seventh successive league title. Meanwhile, Leipzig bound Julian Nagelsmann is seeking a first win in seven outings with current seventh place side Hoffenheim, after drawing their last six. Victors in the corresponding fixture last term, the hosts will be no pushovers as they look to repeat a third home win on the bounce over the Bavarians. Here's 90min's breakdown of the clash. Hoffenheim midfielder Lukas Rupp could face a late fitness test ahead of the clash, in an otherwise injury-free squad. Meanwhile, Brazilian forward Joelinton is set to lead the line once more as he seeks a fifth league goal. ​Bayern have been dealt a blow after Franck Ribery suffered a ​hamstring injury during their recent training camp in Doha. The Frenchman, who had featured in 14 league games, joins Arjen Robben and Corentin Tolisso on the sidelines - with both having made just made a handful of appearances thus far. Hoffenheim​ ​Baumann; Posch, Vogt, Hubner; Nelson, Demirbay, Grillitisch, Schulz; Zuber, Joelinton, Grifo. ​Bayern Munich ​Neuer; Rafinha, Sule, Boateng, Alaba; Martinez, Muller, Kimmich, Thiago, Coman; Lewandowski. The sides have met on 22 occasions in the Bundesliga, with Bayern recording 14 wins to Hoffenheim's mere two, with six ending in stalemate. 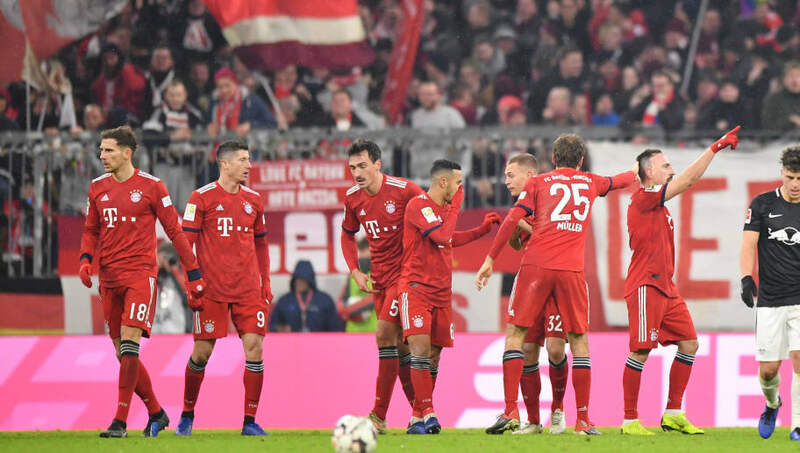 Goals from Robert Lewandowski, ​Thomas Muller and Joshua Kimmich ​​handed Bayern a 3-1 victory at the Allianz Arena in Kovac's first league game in charge. As alluded to, Hoffenheim have proven tough to beat this term and are currently unbeaten in their last 11 league games. Sitting three points off the last Europa League place, the hosts will be seeking an improved second period as they look to emulate a third place finished achieved last term - in Nagelsmann's culminating season before his departure to Leipzig in the summer. Bayern on the other hand, find themselves unusually second best. The 28 time Bundesliga winners have endured an inconsistent campaign by their standards. They've won just half of their eight home games, notably suffering a shock 3-0 ​defeat against Borussia Monchengladbach in October. However, on the back of a five game winning streak, the form of Polish frontman Lewandowski could be vital if they're to catch ​Dortmund, having scored 10 in 16 outings. Proving a bogey ground for the visitors in recent times, this fixture makes for interesting reading as they look to kick off 2019 in style. The miss of influential veteran Ribery could hamper Kovac's outfit, but boast one of Europe's deadly finishers in Lewandowski as they attempt to crack down a side unbeaten since the end of September. It will be a tight affair as both challenge for respective European ambitions.